In 1812 the British/Portuguese Army under Wellington's command besieged the fortress of Badojoz. 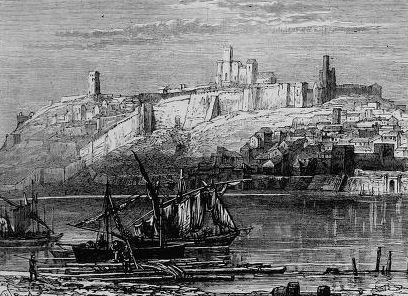 The armies had twice previously tried to enter the fortress but were repelled by the French defenders. An attach was mounted which saw the 2nd Battalion of the 44th play a significant part. 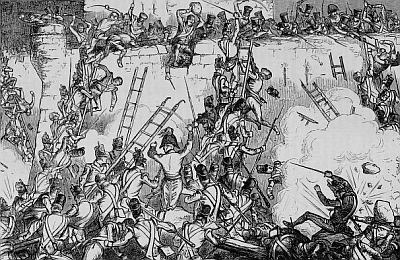 The main company made a diversionary attach while the Light Company of the 44th led the assault by charging thorough the moat and then ascending the walls by the use of ladders during which they were subject of murderous fire from the defenders. The flag of the 44th was the first flag to be mounted on the walls of the castle following a successful invasion that led to the taking of the fortress. Thirty two of the fifty men of the light company were either killed or injured and only one Officer survived.